The first love is never forgotten: this is the true choreographical story of their meeting. Terramara was the first work from this duo-company which delved into the theme of relationships between two beings, a theme which the company would then go on to study and portray in many other ways. Terramara was more than a success in what it achieved. A wonderful and promising debut piece lasting one hour in which excellence is displayed, almost shown off. Delicately choreographed to reinforce those mediterranean characteristics which are all ours, a fine example and certainly to be rediscovered today. 2013. 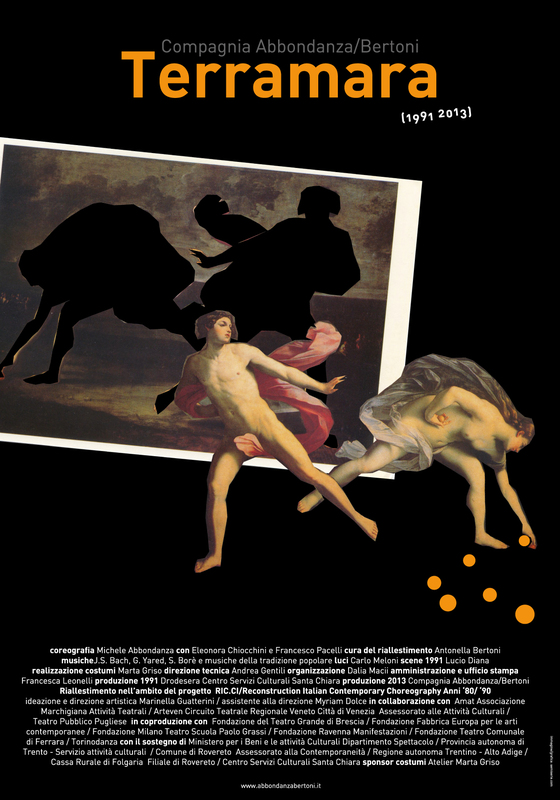 Teatro Toniolo – Mestre (VE) (premiere); Cavallerizza Reale – Torino; Teatro Sociale – Trento; Cantieri Teatrali Koreja – Lecce. 2014. Teatro Comunale di Vicenza; Teatro Camploy – Verona; Teatro cantiere Florida – Firenze - Fabbrica Europa; Teatro della Fortuna – Fano (PU); Ravenna Festival – Teatro Rasi; Brescia – Teatro Grande; Teatro Comunale di Ferrara. 2015. Teatro Gioia – Piacenza; PIM OFF – Milano; Teatro Kismet Opera – Bari; Teatro Verdi – Padova; Chiostro Santa Caterina - Finale Ligure (SV). 2016. Teatro Secci – Terni. 2017. Teatro Sociale – Sondrio.